Tech Environmental completed a comprehensive indoor air quality (IAQ) and airborne mold-testing program for the Lincoln (MA) Public School System. Many kindergarten classrooms throughout the school district showed obvious signs of mold growth at the beginning of the school year and were closed to students and teachers for remediation. After remediation of classrooms was performed, Tech Environmental conducted IAQ testing for airborne mold to verify that these classrooms were safe for occupancy. This testing involved both indoor and outdoor mold sampling for 28 classrooms throughout the Lincoln School District, including many classrooms at the Hanscom Air Force Base. 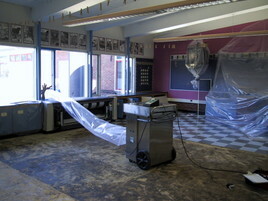 In some cases, testing showed that further remediation was needed for a classroom to be safely occupied. The final analysis showed no significant elevation of mold spore counts inside the classrooms when compared to nearby outside areas, no significant quantities of any unique genus of mold, and no presence of the toxic mold Stachybotrys demonstrating that children and teachers could then reoccupy the classrooms. While many mold remediation companies often recommend replacing building materials and furniture based on moldy odor alone, we prefer a mold sampling and assessment prior to and/or after any remediation. This ensures that only areas of concern are addressed, minimizes cleanup costs, and verifies that those areas that were remediated are now safe for occupancy. A public school system needed to ensure that its classrooms were safe from mold concerns on an expedited timeline. Tech's indoor air quality and airborne mold studies demonstrated quickly and capably that classrooms were safe for occupancy.